Stuffing beef burgers with cheese is a tasty trick and a crowd-favourite. 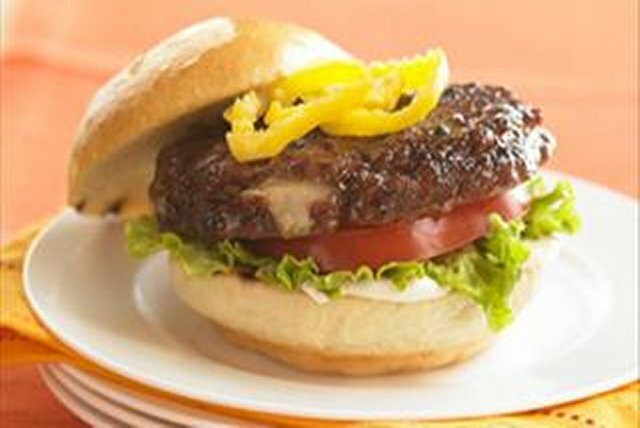 These grilled Cheese-Stuffed Italian-Style Burgers are sure to win rave reviews with burger fans. Heat barbecue to medium-high heat. Mix Miracle Whip and basil. Refrigerate until ready to use. Combine meat and garlic; shape into 8 thin patties. Top 4 patties with cheese; cover with remaining patties. Pinch edges together to seal. Grill 7 to 9 min. on each side or until burgers are done (160ºF). Spread buns with Miracle Whip mixture. Fill with lettuce, tomatoes, burgers and peppers. Omit shredded cheese. Shape meat mixture into 4 patties; grill as directed. Top with 4 Kraft Deli Deluxe Mozzarella Cheese Slices; grill until melted. Assemble sandwiches as directed.